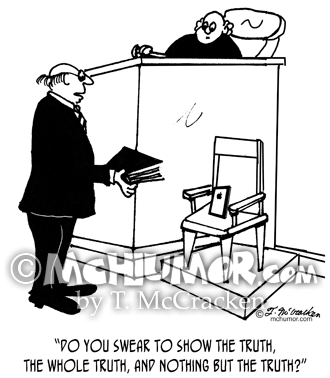 Court Cartoon 5623: The devil in court with his hand on a bible saying, "I swear to tell the whole truth so help me God." 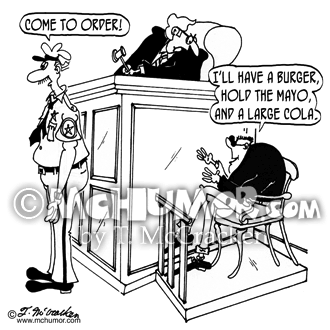 Court Cartoon 5514: When the bailiff yells, "Come to order," in court a witness on shouts, "I'll have a burger, hold the mayo, and a large cola." 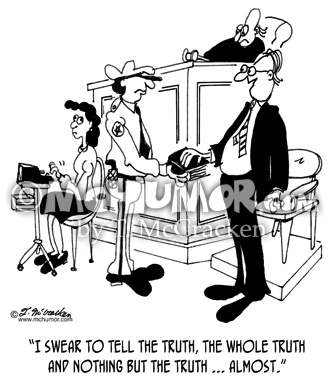 Court Cartoon 5111: Someone in court saying, "I swear to tell the truth, the whole truth and nothing but the truth ... almost." 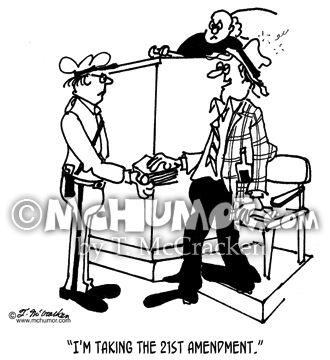 Court Cartoon 3831: A drunk taking the witness stand saying, "I'm taking the 21st amendment." 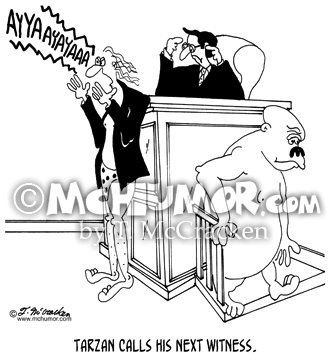 Court Cartoon 5490: "Tarzan calls his next witness." In a courtroom, as an ape leaves the stand, Tarzan, a lawyer, does his AYYAYAAAA yell. 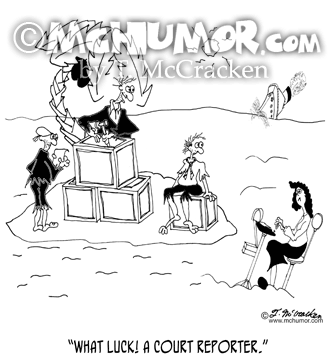 Court Reporter Cartoon 7850: A lawyer and a judge and a witness are on a desert island when they see a court reporter floating by. They cry, "What luck! 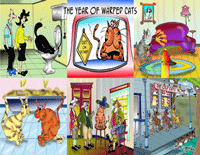 A court reporter." 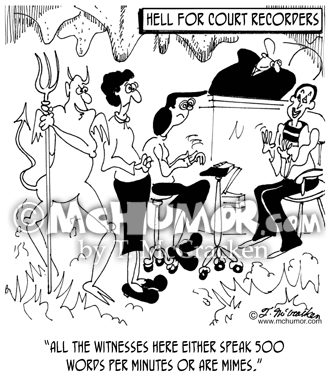 Law Cartoon 7127: "Hell for Court Recorders." 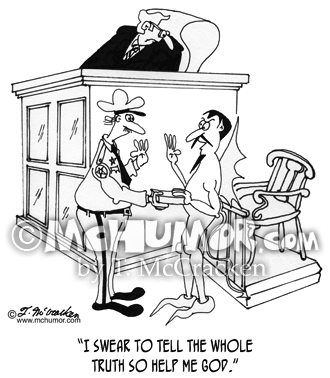 The Devil shows a woman into a cave-courtroom and says, "All the witnesses here either speak 500 words per minutes or are mimes." 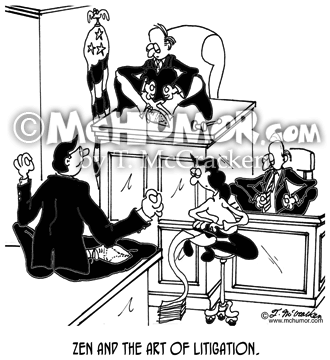 Litigation Cartoon 7849: "Zen and the Art of Litigation." A lawyer, a judge, a witness and a court reporter sit in lotus positions meditating." 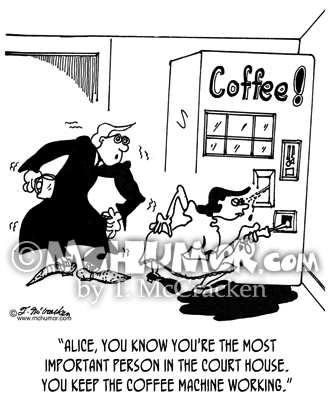 Judge Cartoon 6244: A jittery judge with an empty cup saying to a woman working on a coffee machine with a screwdriver, "Alice, you know you're the most important person in the court house. You keep the coffee machine working."